What’s it like working at a worker co-op? We have thousands of anecdotes and business numbers on our movement, and now for the first time we have data about the lived experience within democratic worker-owned firms. 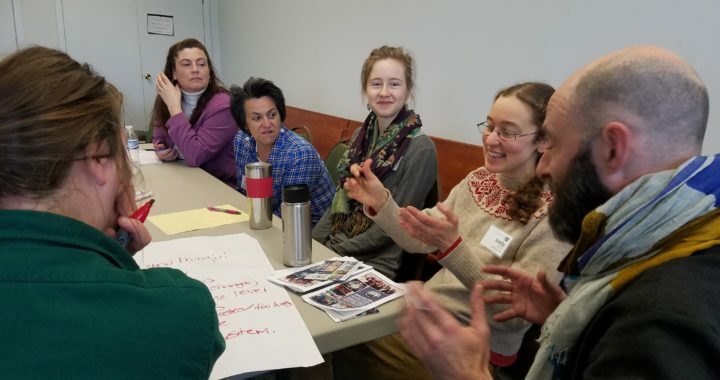 The Worker Co-op Census is the first national study of worker cooperatives from the perspective of individual employees and worker-owners, sponsored by the Democracy at Work Institute (DAWI) and conducted in partnership with the U.S. Federation of Worker Cooperatives (USFWC), Center on Wisconsin Strategy, and University of Wisconsin Survey Center. From job quality, lower turnover, and a greater voice in decision-making, this study shows a deeper view of the experiences, successes, and challenges of democratic business. Worker-owners, newbies to cooperativism, developers, and allies will all gain a better understanding of the field. Let’s use this information to adapt, advocate, and better serve the worker co-op movement! Laura Hanson Schlachter researches the sociology of movements & markets with a focus on labor and the environment. She is a PhD Candidate in Sociology at the University of Wisconsin, whose recent publications have examined labor movement involvement in the emergence of market alternatives in the Rust Belt. Tim Palmer is the Research Director, Tim oversees foundational and strategic research to inform the field. Prior to joining the Democracy at Work Institute, he spent ten years conducting strategic, economic and policy research in the healthcare sector for the Service Employees International Union. He also has experience negotiating at the bargaining table with unionized employers and participating in organizing campaigns. He holds a Master’s degree in US labor history and was a volunteer activist in his graduate assistants’ union while working at the University of Florida. Ana Martina Rivas is the Membership Director of the US Federation of Worker Cooperatives. Born and raised in Mexico City, her work with community media took her to California and Arizona where she collaborated with different independent media outlets. Once she moved to Philadelphia, she served as the Technical Director with the Prometheus Radio Project supporting communities and organizations across the country in their efforts to access community owned media. From 2011 to 2014 Ana Martina helped organize the Spanish Speaker Network Gathering at the Allied Media Conference celebrated in Detroit. In 2014 Ana was invited to join the Rhizomatica project where she helped install mobile phone networks owned by autonomous indigenous communities in Oaxaca, Mexico. Early spring 2016, she moved back to Philadelphia with her partner and 10 month old baby. Back in her community now, she is working towards the creation of a bilingual media tech coop.